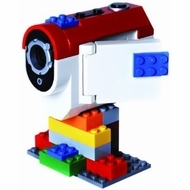 The LEGO Stop Animation Video Camera is a great way to capture both regular video and make awesome Stop Animation videos for any LEGO fan, big or small! Use the included LEGO Stop Animation Studio software to edit the videos you capture or hook your camera up and use the included tripod and two LEGO mini figures to create amazing Stop Animation videos. It's easy to upload your video creations to YouTube using the LEGO Stop Animation Studio software to share them with family and friends.